1. Add all ingredients to a mixing glass(except garnishes). Add ice to mixing glass, shake, and strain into highball glass filled with ice. 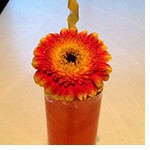 Garnish with lemon twist and edible flower of your choice.